This is the first of a series of shots taken in the footsteps of the great Alex Webb, a photographer who I greatly admire. Webb takes colour street shots of great chromatic contrast and with unsettling, but perfect composition. Some of his very best work is in his book, The Suffering of Light. Even if you don’t normally buy photography books, you should look at this (and buy it). I think it’s my favorite book of its kind of all time. 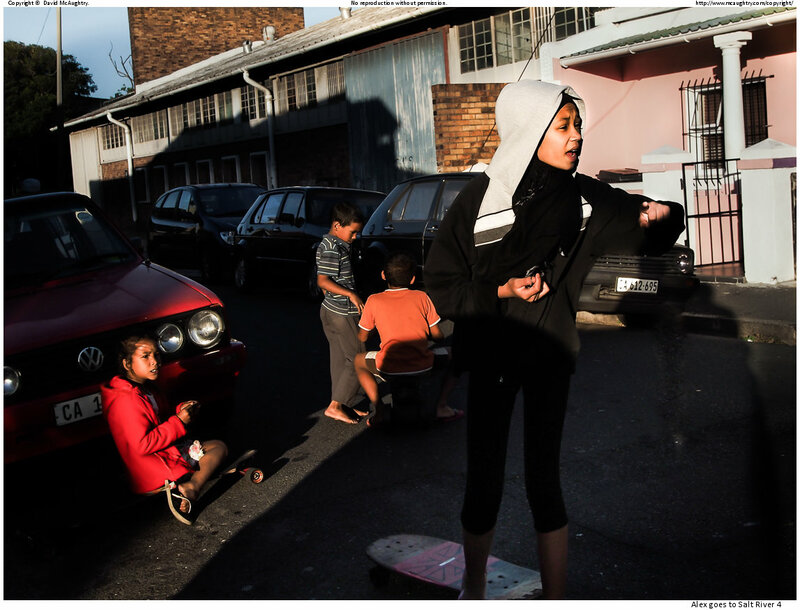 This series was taken in the Salt River area of Cape Town. I had tried unsuccessfully to get the deep Webb shadows in day time – but I finally realized that it was essential to shoot in the 30 minutes or so just before the sun was lost over the city, when the light is low, golden, but still quite hard and contrasty. I am sure now that’s how and when Mr Webb does it. In this particular shot the light was almost horizontal, coming down a street which was angled directly along the line of the sun. These kids were playing in the street, and initially started posing and looking at the camera. After a while, as kids do, they carried on and ignored me, which was when I started to get some more characteristic shots. Technical notes: A strange effect on this shot – I am seeing a very large difference between the shot as portrayed in my processing software – Adobe Lightroom, and how they look on the web or in a JPG viewer. I have had to wind down the saturation significantly for the web version, and it still looks a bit oversaturated. Wonder why? I used my Olympus E-P5 with an ultra wide (18-36 equivalent) zoom for this shot – looking at the actual focal length used it was 35mm. I might as well start using a fixed 35mm prime for street, just in fact like Alex Webb does. I have to say that I absolutely love the E-P5. I have an Olympus E-M1, and I never take it out. I much prefer its little brother.